Info "It won't work to just jam it in there. I tried." Last Piece is one of Dribble and Spitz's microgames in WarioWare: Twisted! 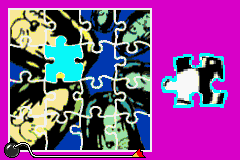 The purpose of the game is to turn the puzzle piece in the correct shape so it will fit into the missing spot of the puzzle. 1st level difficulty: The puzzle is very simple. 2nd level difficulty: The puzzle is a bit complicated. 3rd level difficulty: The puzzle is more complicated. This page was last edited on September 19, 2018, at 21:40.